Five years ago an individual named Doug, went to one of his support staff telling them about a goal he wanted to accomplish. That goal was to get a 9-5 job and work Monday to Friday in the “real world” like other people do and like his foster dad did. That staff started the process by reaching out to local agencies that helped individuals with disabilities to find a job. There was a wait list with no possibilities of getting into the program anytime soon at one place (in fact, 5 years later, still on the “wait” list!) and a newer facility that was quick to offer help and support. Doug started the process of filling out the paper work and being assigned to a job coach to assist him in the process. There was a big push on their part for Doug to volunteer and not look for a paid job. They claimed it would be much easier to find volunteering possibilities rather than paid employment. Doug was very determined and would consistently decline the offer to “work” without pay. Doug and his job coach would go out weekly together to drop off resumes at numerous locations in the Waterloo region and the job coach would talk to the managers/owners of these places about Doug’s abilities and his focus to get a job. Months went by and Doug was still not being hired at any of the places that they went to. They stopped going out weekly to hand out resumes and it slowly changed to every other week, to once a month and then to once and awhile. 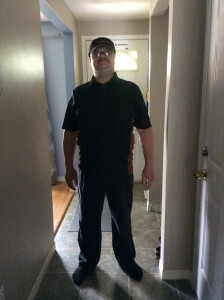 Doug went on numerous job interviews and was never offered a job, but was told either they weren’t hiring, they didn’t have the right position available for someone with a disability or would be told to try a different location within the same franchise. Three years into the process, Doug was finally offered a job working 1 day a week. A month in, he went to his boss asking for more hours (with the help of his job coach) and was offered a second day! He works twice a week cleaning, doing dishes and occasionally helping with making donuts and cookies. Doug’s boss and co-workers are always talking about how much they enjoy his company and how hard of a good worker he is! Doug stood up against the stigma that society has against individuals with a disability and with his determination, resiliency and courage he continued the process until he successfully reached his goal! !